Seven Minutes appears at first to be a pretty straightforward, though stylish, minimalistic platformer. There's a little more to it than that, but for the purposes of this review, I'm not going to tell you much more. 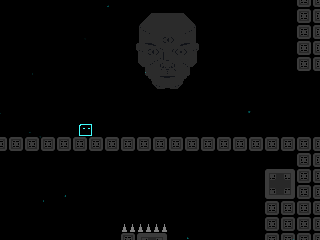 You play as a tiny creature who is given advice by a large floating head who claims to be wise and powerful. You decide whether to take the advice, assuming you can make sense of it. Virtanen cites Cactus as inspiration for Seven Minutes, and I can see evidence of that inspiration in the flashy, frantic nature of the game. Win or lose, the game lasts seven minutes. You know that you've "won" when you see the credits, but there are two other possible endings as well. I think that most people will, like me, see one or both of the losing endings before reaching the ending with the credits. If you happen to get the ending with the credits on your first try, I recommend that you play again and do things differently so that you get the full picture. Sorry that this is kind of vague, but if you try the game you'll understand why this is a little difficult to explain without explaining too much. Seven Minutes is a puzzling platform game that lasts only for seven minutes. "What would you do with the last seven minutes of your life?" Nobody has shared their opinion about Seven Minutes yet. Be the first. Recommendations: The 4 people who like Seven Minutes also like the following games. That was boring, sitting in that one room for 7 minutes. Good game though. Very deep. Some guy on YouTube said he'd rather eat a cookie than run through a 'Maze of Death' in his last seven minutes, I love mazes of death! While it has virtually 0 replay value (once you've beaten it, that is) I honestly enjoyed every second of that game. Creepy, exciting,awesome graphics and music! I just don't know if it was worth playing.... It was good for seven minutes, but all three endings made you feel kind of like you wasted those minutes. I honestly didn't enjoy this game very much at all, and I'm a fan of Virtanen's other work. I guess the lack of gameplay and weak attempt at philosophical musing kind of ruined it for me. I was okay. The graphics were minimal, which was good and bad. Gameplay is addicting and challenging. Great job! Great moral. I loved rushing through the levels, and the end with the invisible blocks was great. Now I'm going to have to wait in the first room to see the right ending. I didn't loose though! decent graphics and style, somewhat interesting idea, utterly unfortunate gameplay (or lack thereof). grr. One of the best games I've played from this site. I loved the frantic pace; the comments the God thing shouts at you were a brilliant touch. nicely made, but you can barely see the character. in platforming, that's essential. personally, i couldn't wait for those 7 minutes to end.